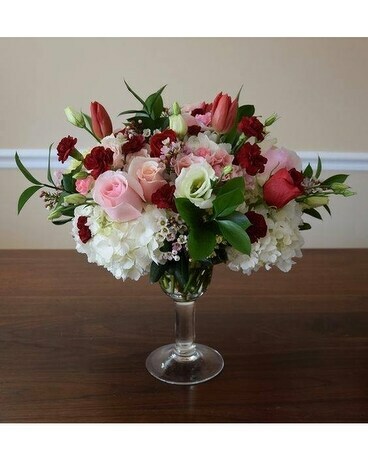 Our Martini Time arrangement holds to its namesake with a sophisticated display of roses, carnations, tulips, and hydrangeas to ensure your celebration is the toast of the town. PRICING AND DESIGN OF THIS ARRANGEMENT VARIES. PLEASE CALL US at 540 908-2333 TO DISCUSS SPECIFICS ON CREATING A VERSION JUST FOR YOU. At The Wishing Well - "Wishes Really Do Come True"